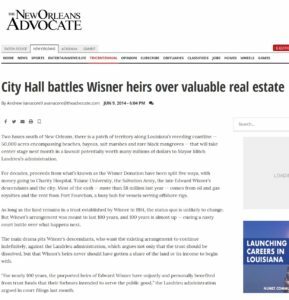 "A Story of Race; A Race to the White House"
Basic Questions: Did Mitch Landrieu re-engineer use of the Wisner LandTrust Grant to promote himself and his initiatives at the expense of other non-profits? Who funded the Removal of the statues? Was something expected in Return? 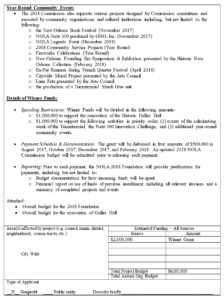 Or were funds donated to the city to feed the homeless and fund the arts misused? 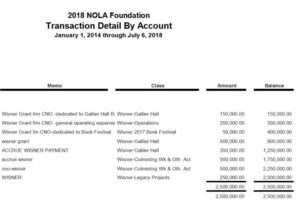 At the same time of these expenses, Mitch Landrieu was re-engineering how the Mayor could spend the grants of the Wisner Land Trust Donation to the City of New Orleans. 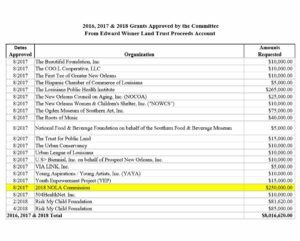 The WISNER LAND TRUST established was established in 1915 by Edward Wisner to create an annual distribution for New Orleans Non-Profits from the rents and royalties form 50,000 acres of reclaimed land. 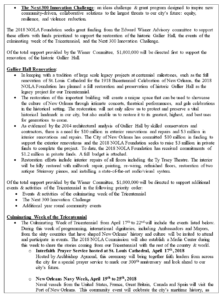 It was re-engineered by Mitch Landrieu 2014 to fund Landrieu's priorities. This was during a time (2016 & 2017) that BP OIL provided major cash distributions of $10,000,000.00 to the Wisner Land Trust. 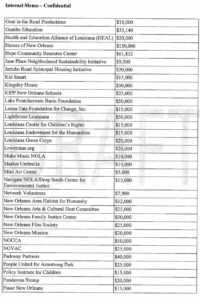 Landrieu awarded those funds to new non-profits he directed for his own projects such as the 2018 Nola Foundation. 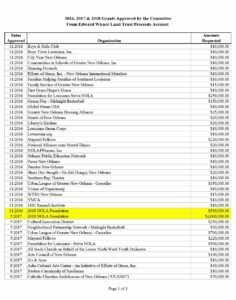 Mitch Landrieu declined approximately $2,000,00.00 in grant applications from New Orleans Non-profits during 2017 & 2018. 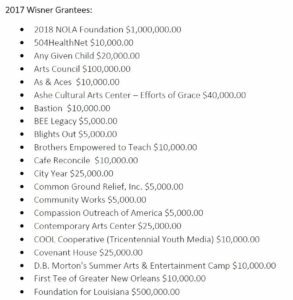 During 2017 to 2018, he awarded $2.5 million to the 2018 Nola Foundation which included the Galas at Gallier Hall in late April 2018. 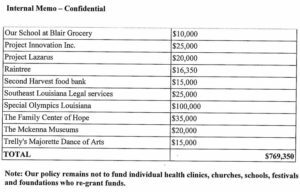 During 2016 & 2017 while denying non-profits grants, Mitch Landrieu was transferring $1,250,000.00 to the Foundation for Louisiana who paid $1,100,000.00 towards the removal expenses of the statues. 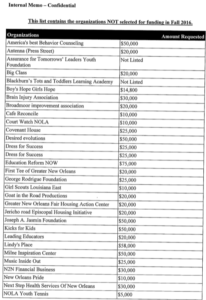 In 2017, Landrieu transferred $2,500,000.00 to a non-profit he seems to have created or directed with Mark Romig called the 2018 Nola Foundation. 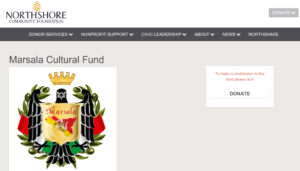 The Foundation originally applied for $500,000.00 but received $2,500,000.00. This was 100 times the average award of Wisner Funds in 2015. 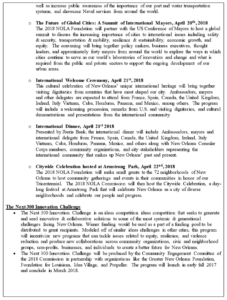 One Million Dollars of this Transfer went to the Mitch Landrieu's Tri-Centennial Galas: One each for International Mayors and one for Domestic Mayors the weekend of April 21 & April 22nd. 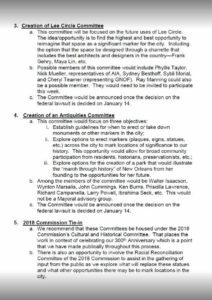 It appears $250,000.00 of the grant was spent on the Slave Trader Markers and Tour App recently implemented in New Orleans. 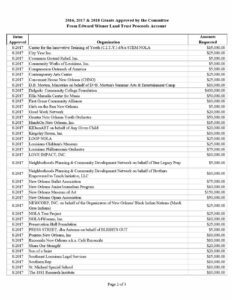 A Spreadsheet showing the $2,500,000.00 Award and how it was spent. 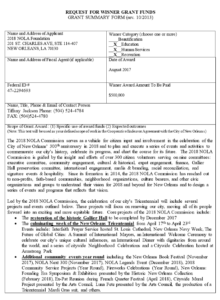 When responding to a Public Records Request from the Mayor's Office, the response only reported $1,000,000.00 awarded to the 2018 Nola Foundation not the $2.5 Million. 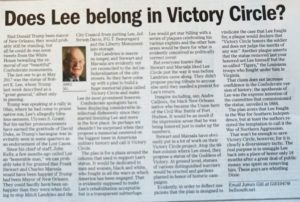 James Gill of The Advocate posted The Question: "Does Lee Belong in Victory Circle?" 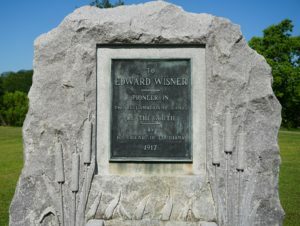 This is because of a suggestion that one of twenty plaques, explain why the monument was erected in 1884 to Robert E. Lee. However, Gill never addressed the question in his commentary and turns to insulting those that made the proposal. 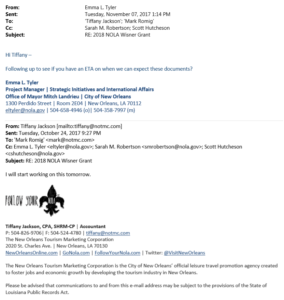 Frank Stewart's Response was posted on October 20, 2018. 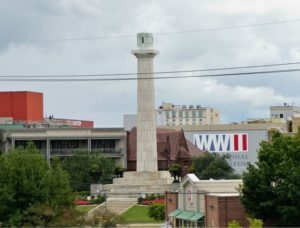 "It was not unexpected to read the normal distortion that James Gill tried to make in his comments concerning the suggested redevelopment of Lee Circle as “Victory Circle.” The proposal has nothing to do with Lee, except to acknowledge the fact that what existed there for over 120 years was a memorial to the life of a great human, General Robert E. Lee, who was not a racist nor a prejudiced individual, as he is publicly quoted in all history books as saying “Slavery is evil.” And his portrait has hung in the Oval Office under many presidents. 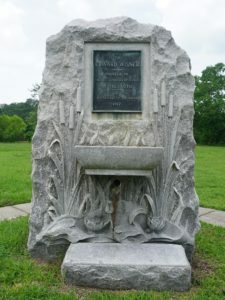 It is a crying shame that a media reporter such as Gill can distort the proposal that Charles Marsala and I have made to turn this major historic landmark location and intersection into a true tribute in honor of the thousands of military and citizens who were killed and missing in action in preserving freedom for all of us. The "Victory of Freedom" that we all enjoy in life has been the result of the personal sacrifices of thousands of fellow citizens. James Gill may want to examine his motives in trying to distort our suggestion, which is well thought out, with no discrimination or disrespect to all races, all genders, and to all those who gave their lives and limbs for our freedom. Shame on you, James Gill, for trying to distort our suggestion by inferring that our ulterior motive is to emphasize “Lee” in the conversion of the circle that hundreds of thousands of people pass every year. Those are your totally wrong assumptions. James Gill is what he is — “the critic who can’t accept a positive suggestion.” Unfortunately, we must accept your nature! Shame on you! We are not whistling “Dixie,” but the national anthem, and we hope you will stand up and not kneel down, as you probably do." 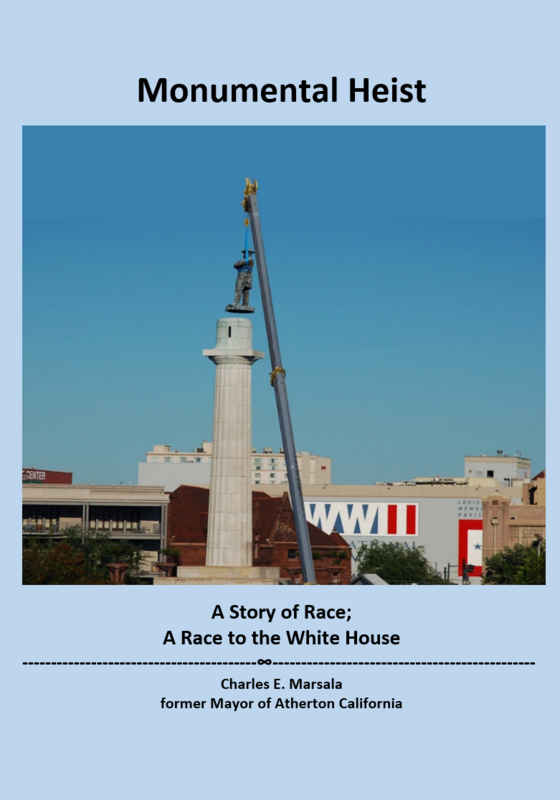 Who Acquired the Monument Cranes and Why did they sit on city land for 8 months following the removal? 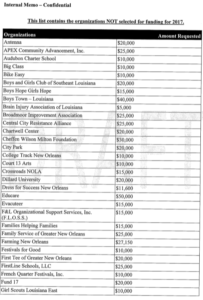 Did the City of New Orleans buy the cranes without competitive bids ? 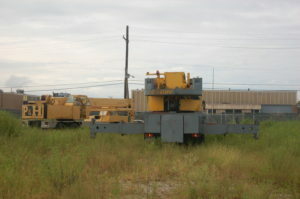 Why are they stored on City Property ? 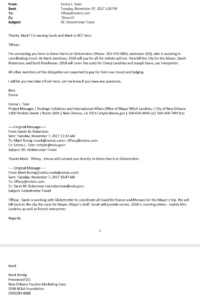 Were city employees making outside business interest income using city equipment ? What will happen to the statues ? Were they intended for campaign donors ? 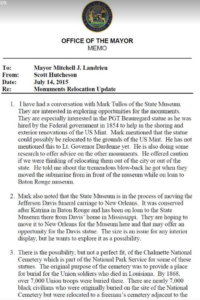 Was the intent to transfer the priceless statues to a campaign donor? Videos on Modern Day Slavery, Child Advocacy, Domestic Violence Awareness, Wounded Military Support Organizations, Coastal Erosion, and the lives of the men of the Monuments were funded by the Marsala Cultural Foundation.